Inspired by yesterday's post, what kiddie TV shows gave you nightmares? Or in other words, inspired by the name of the guy who beat Arlen Specter, how scary were the Sleestaks from "Land of the Lost"? They were reptiles! But they were kinda insecty! And sorta human! They make a horrible hissing sound! They have horns, and bulby eyes! They were ... so slow you could walk away from them, but we never really realized that. Just the name was creepy. Sleeeee-stak. 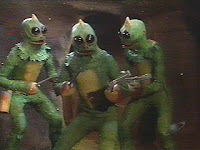 When my friend Lisa and I were in college, we would sometimes walk to her house from school, and we always passed a dentist who had a name a lot like Sleestak, and we could NEVER not comment on it. According to Wikipedia, there were only three Sleestak costumes, that had to be shared. And as Rob always reminds me, ex-NBAer Bill Lambeer filled one of them, because they went to his high school and got some tall guys to volunteer. Did Sleestaks freak you out, or were there other TV baddies who haunted your dreams?